This little cookbook was an impulse purchase when it came out a couple of years ago, like many impulse purchases soon relegated to the shelves and mostly ignored. But I was looking for something to help me empty the freezer and this hotpot was just the job to use up a couple of lamb chops! Preheat your oven to 170C. I’m not on a diet (if you read this blog regularly, that hopefully goes without saying!) so I was less than entirely fussy about trimming ‘any visible fat’ off the lamb. I did trim off the biggest chunks, though! Season the lamb a little and fry brown it off in batches in a frying pan with a little oil (just a single teaspoon, if you’re following the recipe!) before transferring to the casserole dish. I also softened the onion and *whisper it* added a crushed clove of garlic, which may not be quite traditional for a proper Lancashire hotpot! Peel and cut the carrots into chunks. 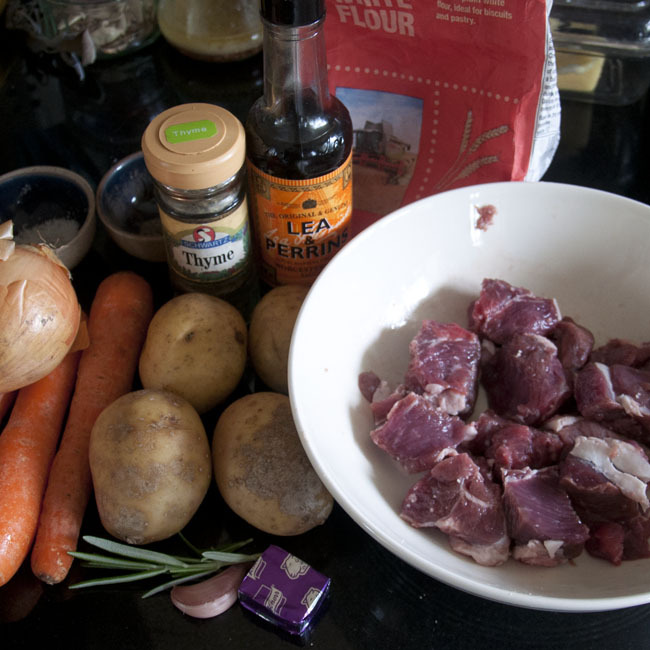 Add the carrots and onions to the meat in the casserole dish, sprinkle over 1.5tbsp of plain flour, and mix well. Make up 300ml of lamb stock with the stock cube (mine made 450ml, so I used 2/3rds) and add this to the casserole dish, along with a generous pinch each of dried rosemary and thyme and a tablespoon of Worcestershire sauce. Finally add a big pinch of black pepper, and mix well. Peel and slice the potatoes about 5mm thick, and arrange them decoratively over the top. Add an extra sprinkle of pepper over the top, cover snugly and pop in the oven for 1hr. After an hour, take off the lid and return to the oven for a further 45 minutes. 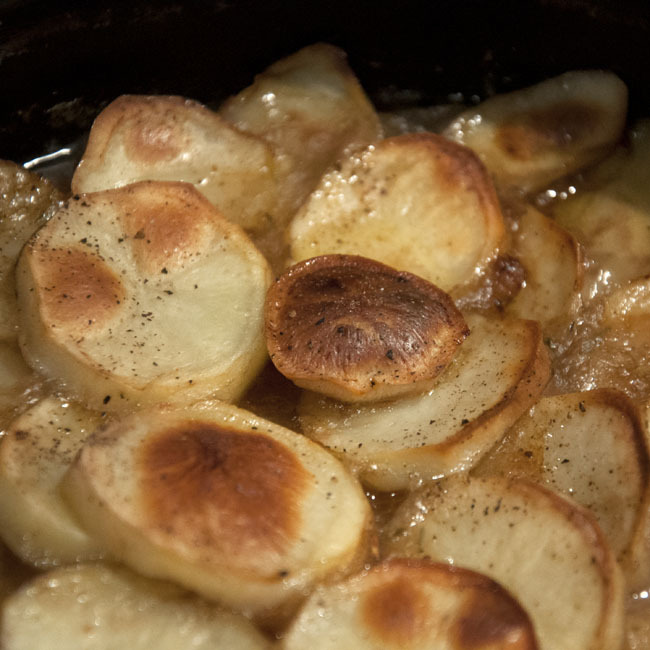 The hot pot is done when the potatoes are beautifully browned. Serve with lovely seasonal steamed vegetables, and enjoy! Soft cover, 192 pages, full colour. RRP £14.99. I think I’ve been a bit unfair to this cookbook – it was bought with ‘good intentions’, particularly because I hoped it might contain some packed-lunch inspiration. The ‘lunchbox’ section at the back turned out to be rather short and a bit disappointing, and so it went to live on the shelves, more or less ignored until I got it out again last week for the blog challenge. Unusually – particularly as I’m having to be especially fussy about using what I’ve got and not buying random ingredients just now – I had a choice between several different recipes, and didn’t need to substitute creatively, either! These recipes are, first and foremost, good decent food, selected because they happen to be lower in fat / calories / whatever. Now, I fundamentally don’t like diet recipes, because they tend to include a raft of nasty ‘cheats’ to con the flavour back into food which has been lost due to removing fats, oils, and carbs. There’s none of this here, just normal store-cupboard ingredients; if you soft-pedal on the slightly obsessive fat-avoidance, there’s some great stuff here. From Si and Dave of ‘Hairy Bikers’ fame, I suppose that should come as no real surprise! There are plenty of recipes here that I’m going to want to make in the future – from the cassoulet, to a selection of ‘fake-away’ curries and Chinese meals, stews, pies, and one-pot suppers. Ignore the ‘diet’ marketing, and add this little cookbook to your collection – this is a (coincidentally healthy) weekday-supper goldmine! This entry was posted in Books, Challenge, Cooking the Books, Meat, Recipe, Review, Seasons, Winter and tagged country skills, food, recipe, seasonal by Kate Watson. Bookmark the permalink. lamb hotpot is one of my favourite dishes. I can’t really see how it could be done in a none diety way.